cairnswk wrote: Well, that is a surprise MrBenn. Thank you. cairnswk wrote: AndrewB, some changes to the xml if you would please. 1. the neutrals on PRA have been removed. 2. LOS has been added to Ivory Coast line and YND & ACC moved. 4. New line names - can you check those please. 5. Adjusted bonuses for some lines. This is finished as far as gameplay goes so you should be almost right to wrap up the xml. 1. neutrals in "PRA Pretoria N" were removed. 4.a). "The Great Northern Express" was renamed to "Great Northern Express". 4.b). "The Sahara Express" was renamed to "Sahara Express". 4.c). "The Algerian" was renamed to "L'Algérian". 4.d). "The Continental" was renamed to "El Continental". 4.e). "The Ivory Express" was renamed to "Côte-d'Ivoire Express". 4.f). "The Equatorial" was renamed to "Le Équatoriale". 4.g). "The East Coaster" was renamed to "East Coaster". 4.h). "The Desert Express" was renamed to "Kalahari Express". 4.i). 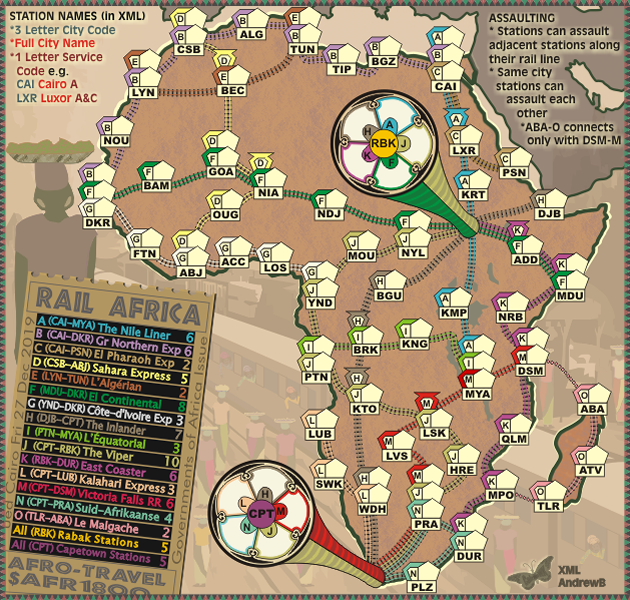 "The Victoria Falls Express" was renamed to "Victoria Falls Rail Road". 4.j). 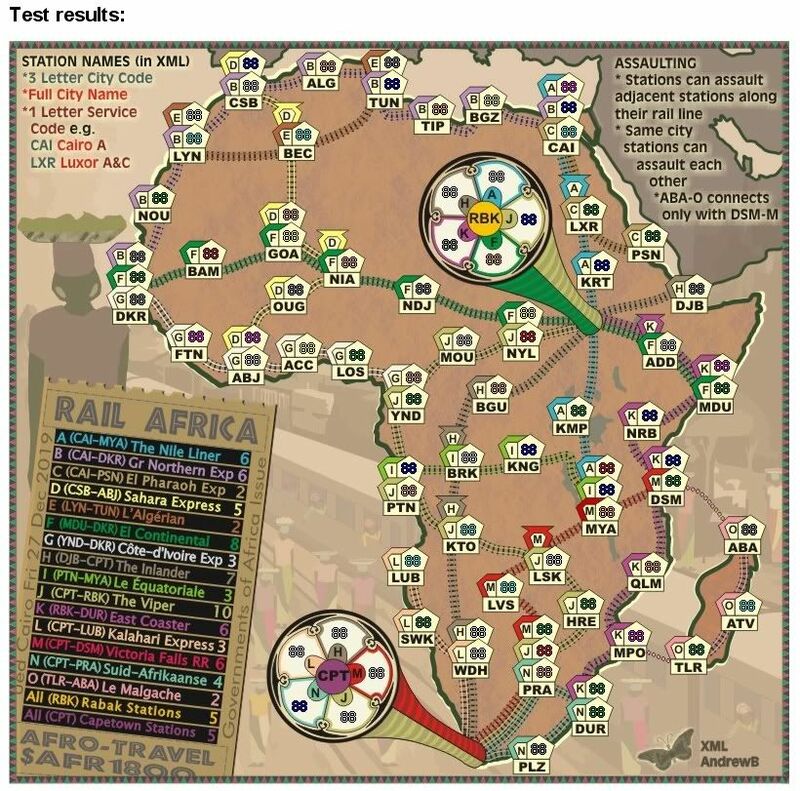 "The Blue Line" was renamed to "Suid-Afrikaanse". 4.k). "La Madagascan" was renamed to "Le Malgache". Location Changes (Ongoing, as the 88 cursor file is gone). It's kinda good to know that I'm not the only one who can't find the 88 cursor file. Assuming "Le Équatoriale" is French, the correct spelling would be "L'Équatoriale" . ender516 wrote: It's kinda good to know that I'm not the only one who can't find the 88 cursor file. Hmm, on second thought, my rusty French skills have betrayed me. Because French uses two genders, masculine and feminine, we need to decide exactly what "The Equatorial" is modifying. "Le" and "Équatorial" are masculine forms, while "La" and "Équatoriale" are feminine. However, "Le" always becomes "L'" before a vowel or an h. So it is either "La Équatoriale" or "L'Équatorial". For example, "Equatorial Guinea" is "Guinée Équatoriale", while "equatorial climate" is "le climat équatorial". Since "railroad" is "chemin de fer" (iron road) and this is masculine, I would go with "L'Équatorial". By all means find a French speaker if you can, but I did take French in school here in Canada for eight years. Duh! me. not knowing or realising what this was. Found it know, thanks to AndrewB. Last edited by hahaha3hahaha on Fri Oct 26, 2018 4:17 am, edited 1 time in total. 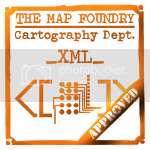 XML is completed and ready to varifications. AndrewB...sorry, but OUG D is missing an army. Didn't see that change in the list of changes. 1. Added OUG Ouagadougou D.
AndrewB wrote: Didn't see that change in the list of changes. Last edited by cairnswk on Tue Nov 24, 2009 1:34 am, edited 3 times in total. I have split the small file into small and large maps. There was an issue in the upscaling from the small to the large and this has been resolved so that there is no longer a one pixel border showing on the left or bottom of the large map. The master files are now in .png format, but the tests 88s are in opn jpg. I have also taken the XML to version 9 (AndrewB's last version was V8) now, and i think the centering is more complete now, although i'd like someone with really good eyes to cast that overview please. KTM -> KRT (as per map) has also been rectified. And hoping that we get an upload soon , i think Forza AZ has checked the XML and is OK with that ?? Last edited by cairnswk on Tue Dec 08, 2009 5:02 pm, edited 1 time in total. Last edited by cairnswk on Wed Nov 25, 2009 2:28 am, edited 1 time in total. there are a few spelling mistakes in the xml. the ones i've noticed are L'Algérian for l'algérien, N'djamena for N'Djamena, Kinshasha for Kinshasa and Capetown for Cape Town. as for the equatorial, i believe it's either l'équatorial or la équatoriale, but am not sure which. iancanton wrote: there are a few spelling mistakes in the xml. the ones i've noticed are L'Algérian for l'algérien, N'djamena for N'Djamena, Kinshasha for Kinshasa and Capetown for Cape Town. I think you're right about those spellings, except that l'algérien should still be capitalized: L'Algérien. Similarly, as I mentioned a while back, it would be L'Équatorial or La Équatoriale, with the former being my preference. Also, it is not uncommon for capital letters in French to omit the accent, but it is not wrong to have it. L'Équatorial will be final. <name>I: L'&#x00C9;quatoriale</name> in XML. I'll adjust the xml and the map, and hope the God I never have to do another French name again. These should be final images, with adjusted ticket and xml request change as per above. Last edited by cairnswk on Thu Dec 03, 2009 6:03 pm, edited 1 time in total. i've spotted two others and checked for more suspects, just in case: in the xml, we have swapokmund instead of swakopmund; laayoune is supposed to have a circumflex (â) on the second a.
the xml says L'Algérian and L'Équatoriale, which is different from ur decision. the changes below ought to fix the french names. 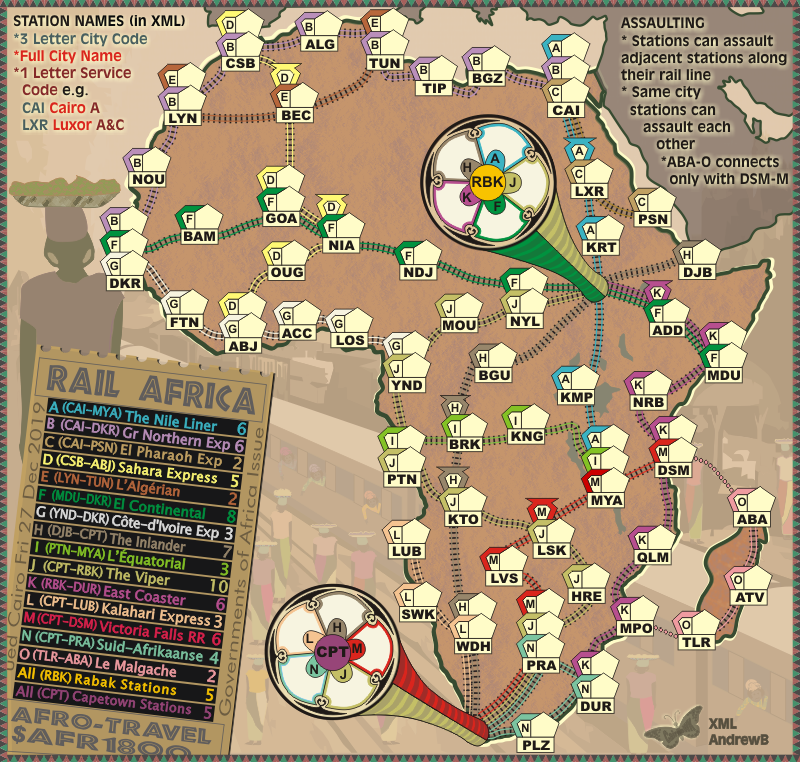 iancanton wrote: i've spotted two others and checked for more suspects, just in case: in the xml, we have swapokmund instead of swakopmund; laayoune is supposed to have a circumflex (â) on the second a.
Bugger, i don't have much luck at times. Ian, those should all be fixed now. 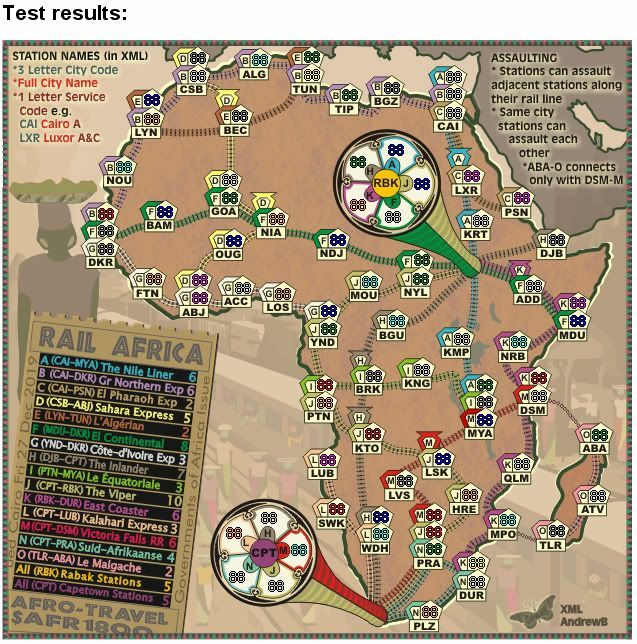 Re: RAIL AFRICA [D,Gp,Gr] (V18)P16 XML passed?? Another small thing is the link between G-ACC and G-LOS, with the 888 the rail is complitely cover, but honestly the game isn't worth the candle.